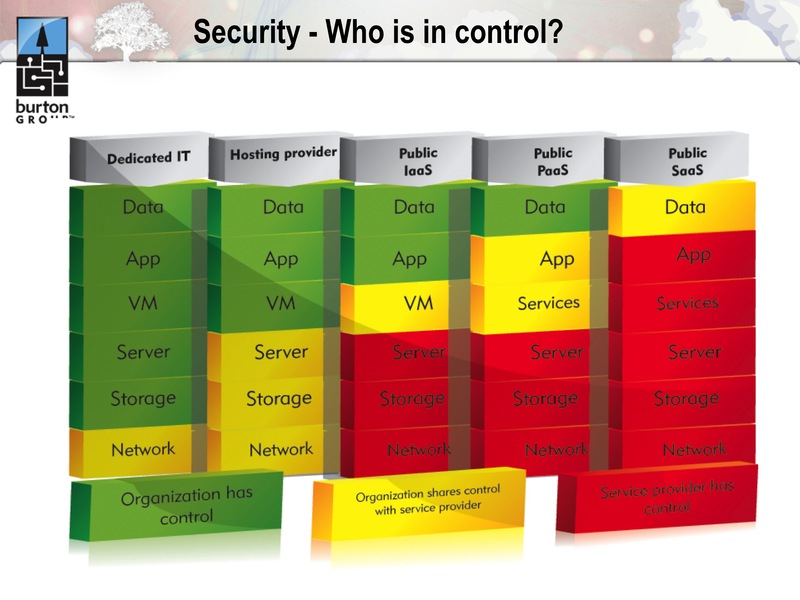 This graphic does the finest job I have seen of clearly articulating where the boundaries of control lie under the different models of cloud computing. Cloud, after all, is really about surrendering control: we delegate management of infrastructure, applications, and data to realize the benefits of commoditization. But successful transfer of control implies trust–and trust isn’t something we bestow easily onto external providers. We will only build this trust if we change our approach to managing cloud security. Cloud’s biggest problem isn’t security; it’s the continuous noise around security that distracts us from the real issues and the possible solutions. It’s not hard to create a jumbled list of things to worry about in the cloud. It is considerably harder to come up with a cohesive model that highlights a fundamental truth and offers a new perspective from which to consider solutions. This is the value of Dan’s stack. The issues in the cloud that scare us the most all fall predicatably out of the change in control this environment demands. Enterprise IT has carefully constructed an edifice of trust based on its existing on-premise security models. Cloud challenges these models. Cloud rips pieces from the foundation of this trust, leaving a structure that feels unstable and untrustworthy. We cannot simply maintain existing security models in the cloud; instead, we need to embrace a new approach to security that understands the give-and-take of control that is inherent to the cloud. This demands we recognize where we are willing to surrender control, acknowledge that this conflicts with our traditional model, and change our approach to assert control elsewhere. Over time we will gain confidence in the new boundaries, in our new scope of control, and in our providers–and out of this will emerge a new formal model of trust. Let’s consider Infrastructure-as-a-Service (IaaS) as a concrete example. Physical security is gone; low-level network control is gone; firewall control is highly abstracted. If your security model–and the trust that derives from this–is dependent on controlling these elements, then you had better stay home or build a private cloud. The public cloud providers recognize this and will attempt to overlay solutions that resemble traditional security infrastructure; however, it is important to recognize that behind this façade, the control boundaries remain and the same stack elements fall under their jurisdiction. Trust can’t be invested in ornament. If you are open to building a new basis for trust, then the public cloud may be a real option. “Secure services, not networks” must become your guiding philosophy. Build your services with the resiliency you would normally reserve for a DMZ-resident application. Harden your OS images with a similar mindset. Secure all transmissions in or out of your services by re-asserting control at the application protocol level. This approach to secure loosely coupled services was proven in SOA, and it is feasible and pragmatic in an IaaS virtualized environment. It is, however, a model for trust that departs from traditional network-oriented security thinking, and this is where the real challenge resides. K. Scott Morrison is the Chief Technology Officer and Chief Architect at Layer 7 Technologies, where he is leading a team developing the next generation of security infrastructure for cloud computing and SOA. An architect and developer of highly scalable, enterprise systems for over 20 years, Scott has extensive experience across industry sectors as diverse as health, travel and transportation, and financial services. He has been a Director of Architecture and Technology at Infowave Software, a leading maker of wireless security and acceleration software for mobile devices, and was a senior architect at IBM. Before shifting to the private sector, Scott was with the world-renowned medical research program of the University of British Columbia, studying neurodegenerative disorders using medical imaging technology. Scott is a dynamic, entertaining and highly sought-after speaker. His quotes appear regularly in the media, from the New York Times, to the Huffington Post and the Register. Scott has published over 50 book chapters, magazine articles, and papers in medical, physics, and engineering journals. His work has been acknowledged in the New England Journal of Medicine, and he has published in journals as diverse as the IEEE Transactions on Nuclear Science, the Journal of Cerebral Blood Flow, and Neurology. He is the co-author of the graduate text Cloud Computing, Principles, Systems and Applications published by Springer, and is on the editorial board of Springer’s new Journal of Cloud Computing Advances, Systems and Applications (JoCCASA). He co-authored both Java Web Services Unleashed and Professional JMS. Scott is an editor of the WS-I Basic Security Profile (BSP), and is co-author of the original WS-Federation specification. He is a recent co-author of the Cloud Security Alliance’s Security Guidance for Critical Areas of Focus in Cloud Computing, and an author of that organization’s Top Threats to Cloud Computing research. Scott was recently a featured speaker for the Privacy Commission of Canada’s public consultation into the privacy implications of cloud computing. He has even lent his expertise to the film and television industry, consulting on a number of features including the X-Files. Scott’s current interests are in cloud computing, Web services security, enterprise architecture and secure mobile computing—and of course, his wife and two great kids. Yahoo! Architect Douglas Crockford Proposes "A Kinder, Gentler HTML 5"
HTML5: Media in a Flash...Without Flash!